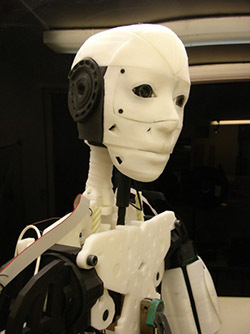 When I think about humanoid robots, I don’t usually associate them with DIY projects. So you can imagine my surprise when I stumbled across the blog, InMoov, where an open source robot is being built. Designed to be more animatronic than artificially intelligent, the InMoov robot’s “skin,” joints, gears and many other pieces have been 3D printed. But aside from the technology used to create the robot, the determination and ingenuity on display in this project is something to behold. Since October 2012, Gael Landevin has been building the InMoov robot step-by-step. Starting with an Arduino-controlled hand and forearm, the robot slowly came to life. While there is still much to be done before the robot is a finished product, the advancements made by Landevin are beyond impressive. If you’d like to help improve the InMoov robot, or just build one on your own, visit the InMoov blog for all of the instruction, BOMs and advice you’ll need.